Whether you’ve been working hard, hardly working, or enjoying a balance of both this summer, I’ll bet the past few months have flown by fast. They have for me, anyway, as I’ve enjoyed some (too brief!) time with my college boys, helped my husband Dave ramp up his new business, co-managed SageBroadview, and – of course – kept reading every day. So here it is, almost September, and already time to wrap up this year’s Summer Retirement Summary. 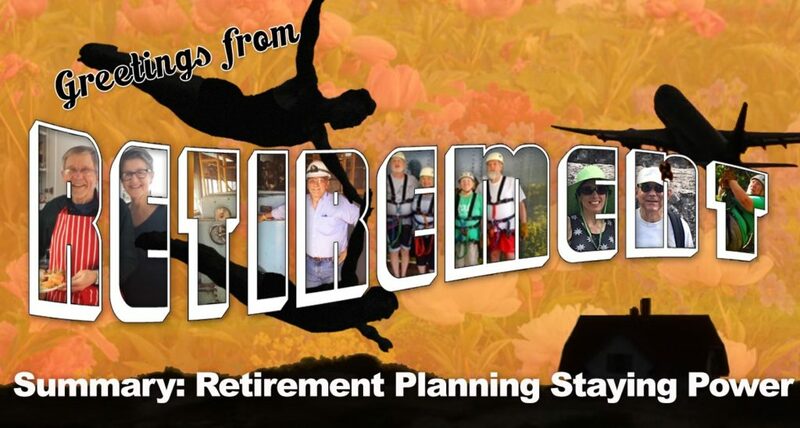 I hope you found inspiration by reading some of the creative ways others have approached retirement. While we’ve barely skimmed the surface of the ocean of possibilities, a few common themes emerged. Whether you plan to retire early or partially, take mini-retirements or re-career along the way, retire right on schedule, or never fully retire at all, it takes staying power to make the most of whatever lifestyle you choose. If there’s one thing that’s no surprise, it’s that life is full of surprises. For all the careful planning we do, the logistics or even your own perspective can change. You may decide to return to the workforce, like my husband Dave did. Or you may find it fulfilling to volunteer your professional time and talents, like Jack Pasanen has as a volunteer educator. Regardless of where life takes you, it’s usually sensible and satisfying to stay connected with your existing community, even as you form new ties. Pairing nicely with staying connected, it’s also a good idea to remain curious and open to brand new “What if?” possibilities, as Greselda Powell has been doing during her re-careering adventures. Besides generating personal and professional networking opportunities, there’s scads of research suggesting that a healthy curiosity can deliver all sorts of physical and emotional benefits throughout your life. In work and retirement, remain open to your next big opportunities. Take the time to explore new offers as they arise. But as Jill Pasanen discovered during her career, sometimes the best course may be the one you’re already on. Remain flexible to either possibility. If you’re a couple, it also can help to form your retirement plans in a tag-team approach, like Pat and Jim O’Konis did, rather than rigidly assuming that both of you must adhere to the exact same timeline. I’d be remiss if I didn’t emphasize the importance of ongoing financial life planning as integral to your retirement goals, whatever they may be. While things may not turn out precisely as projected, knowing roughly where you stand not only helps you make sustainable decisions, it can help you feel more comfortable with the choices you do make. By keeping it real, you can best avoid excessive spending on the one hand, as well as unwarranted frugality on the other. As I covered in this post, “The Gift of Multiple Careers,” it’s rare these days when anyone fits the classic mold of joining a firm right out of school and remaining there, a loyal corporate worker-bee, until the send-off party at age 65. Instead, no matter how early you begin saving for your retirement or how carefully you craft your plans, life has a way of tripping us up with setbacks and surprises. All of the retirement tales I’ve shared this summer illustrate these realities; you probably have tales of your own to recall too. If you’ve stuck with my summer series so far, I’d say you’ve already demonstrated you’re the resilient sort – and I thank you for that. Now, all you have to do is apply that stick-to-it determination to your retirement planning, and you should be on your way. As always, let us know if we can help. SAGE Serendipity: Monday’s solar eclipse brought tourists out to the totality zone in droves. 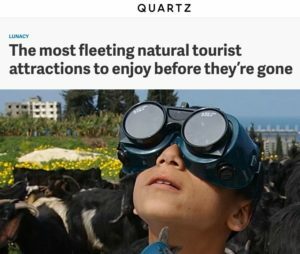 Hurricane waves, Aurora Borealis, solstices “are a few other short-lived natural tourist attractions that are guaranteed to provide a lifetime of bragging rights.” Check out Quartz.com article, The most fleeting natural tourist attractions to enjoy before they’re gone. for more ideas.